Initiated in 1999, the first ToE flagship program addressed (and addresses) key debates of its time -- on globalization and Europeanization, most notably the founding, widening, and deepening of the European Union. The argument: Existing EU-centered histories analysed the formal integration process: politicians negotiating treaties from the 1951 Paris Treaty (founding the European Coal and Steel Community) to the EU. By contrast, Tensions of Europe spotlighted a bottom-up, hidden integration through technology, which profoundly shaped European identities and everyday life: Since the 1850s at least, technology producers, regulators and users have connected and fragmented Europe by linking (or non-linking and de-linking) transnational infrastructure, and by circulating and appropriating knowledge, standards, artefacts, user practices, and so on. The program developed in three overlapping phases. Recognized as a European Science Foundation Network of Excellence, Tensions of Europe organized a series of 20 thematic workshops that expanded the network and explored the intellectual agenda. Central themes: the European city, transport and mobility, the rise of the consumer society, colonization and decolonization, agriculture and food, communication, large infrastructure systems, military technology, and information systems. For thematic publications click here. This work led to a joint research agenda presented at the first ToE Conference (Budapest, 2004): Inventing Europe: Technology and the making of Europe from 1850 to the present. By then, over 200 people from over 20 countries contributed to this endeavor. Europe's hidden integration was a global process, crucially involving transatlantic and (post)colonial connections. Inventing Europe was reviewed in a final report by the European Science Foundation in March 2011. The collaborative research resulted in the research and dissemination program Making Europe: Technology and Transformations, 1850-2000. 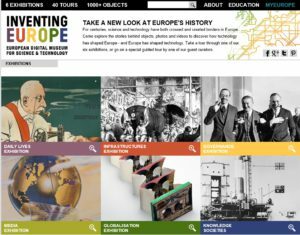 The program shows how engineers, companies and citizens started building a united Europe more than 150 years ago by circulating goods, people, energy, ideas, and information between countries. Making Europe reveals the history of Europe that wasn't shaped by political treaties, but through day-to-day practices of companies, consumers and organizations via transnational networks and infrastructures. 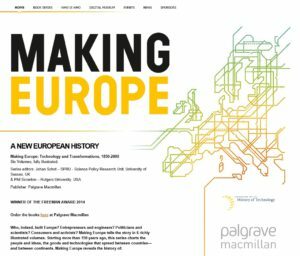 Making Europe results in a new history of Europe published in a six-volume book series (2013-2018) and an innovative virtual exhibit.